There's still time to play along with this months Our Daily Bread Designs Let Your Light Shine Scrapbook Challenge! The theme this month is to create a layout of any size using at least one circle, ODBD stamps, and your favorite color or a color in your photo(s). Your circle(s) can be included by using embellishments, the way you cut a photo, etc. For more details click here. 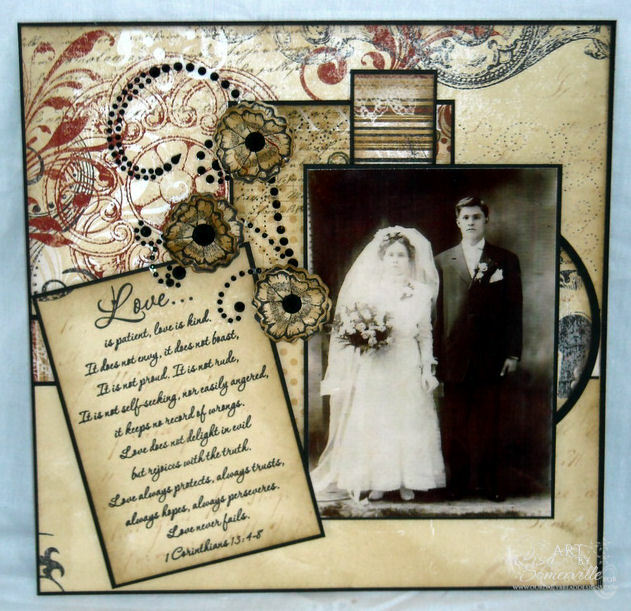 I created an 8"x8" page using a Wedding Photo of my Great Grandparents. You'll see circles represented in my layout on the Bo Bunny papers, Recollection Pearls, Sweet William flower centers, partial circle behind the photo (it's actually a full circle, but when messing with my LO, I covered most of it). There's even some circles in the added Paper Piercing which happens to be this ODBD Shining Light Challenge! Both the Verse and Sweet William flowers are stamped in Ranger Black Archival on scraps of Bo Bunny paper, all edges are sponged in Ranger Walnut Stain Distress Ink. The Sweet William Flower Blossoms are pinched and scrunched (that's a term, right), then layered on top of each other and adhered to the page with a brad, Pearl centers are glued over the brad. The Paper Piercing was added to the left and right of the photo. We would love to have you play along with this months challenge! To be eligible for chance to win a $25 ODBD Gift Certificate, create your page following the details on the ODBD Blog, then leave a link to your creation here on the ODBD Blog using Inlinkz. Such a stunning layout Lisa! Love the photo of your great grandparents. You have preserved the memories beautifully here! Have a blessed day! Gorgeous layout! Beautiful colors and flowers! just a portion of your talent- thanks for sharing. Wow, you out did yourself! This is a beautiful tribute to your past. And it's all done Lisa style. That's fabulous that you have your great grandparents wedding photo! Wonderful! Love the layout...it is just beautifully vintage! 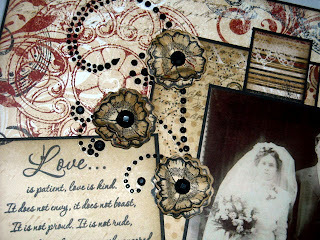 What a fabulous layout- beautiful picture and embellishments. Lisa this is such a beautiful tribute to your Great Grandparents! Lovely layout and design! You are great at the scrapbooking, this page is beautiful!! Great colors and beautiful vintage photos. Gorgeous page Lisa!! Love the photo of your great grandparents. The colors are perfect for the old photo!! Great layout and details!! Thanks for supporting the SHining the Light challenge this week!!! It is greatly appreciated! Absolutely gorgeous!!!! Wow this is a beautiful layout!!!!! Great job!!!! This is more than just amazing Lisa, this is Awesome! I absolutely love, love those flowers and the layout is the best I have every seen! TFS! What a beautiful layout. Love how you added so much dimension to the stamped flowers.